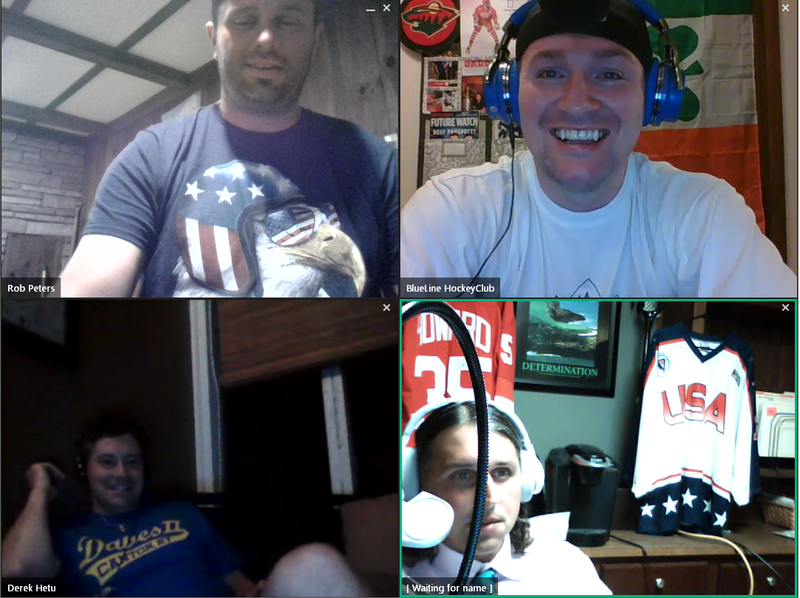 BlueLineHockeyClub - "Thanks for listening to our podcasts!" Use code 04BLHC15OFF for 15% off! U. Wisconsin - Stevens Point, Division III Men's Head Hockey Coach, National Champion, Coach of the year! Baker was selected by the Quebec Nordiques in the 1988 NHL Supplemental Draft. Following an outstanding college career with the St. Lawrence University Skating Saints, Baker went on to play in parts of 10 NHL seasons. In 404 career games, he tallied 71 goals and 150 points. Baker also appeared in 25 Stanley Cup playoff games. As a player, Baker is best known for scoring the series-winning goal for the San Jose Sharks in the seventh game of the 1994 Western Conference Quarterfinals against the heavily favored Detroit Red Wings. Baker is tied with Jeff Friesen for the Sharks single-season short-handed goals record with 6, set in his 1995-96 season during which he scored 16 total goals. Born in New Jersey with a condition known as tibial hemimelia, I was born without either of my tibia bones which resulted in having my legs amputated above the knee at 10 months old. With the guidance of my parents and friends, I learned from a young age that some circumstances cannot be controlled, but attitude can, which is something that has stuck with me to this day. Fully embracing a positive attitude throughout life, I was a regular participant in physical education classes despite having much less speed, agility, and footwork on my prosthetic legs than my peers had. However, longing for a competitive outlet to compete with athletes on a level playing field, I discovered sled hockey and started playing at age 10. After playing a few years and being invited to various USA Hockey player development camps, I was asked to join the 2008-2009 US National Sled Hockey Team despite not trying out. Being the youngest and most inexperienced member of the team, I watched, learned, and practiced with some of my childhood idols as a 15 year old which ended with the team’s first world championship in a 1-0 win over Norway in Ostrava, Czech Republic. Leading into the 2010 Paralympic year’s tryout, I was (overly) confident, especially being on a world championship team the past year. However, once the initial 18 man roster was released, my name wasn’t on it. Vowing to work to prove the coaching staff wrong, I played with the Junior National Team and lead as one of their captains at the beginning of the season. Seeing physical improvement and a winning attitude, the team called me up to the national team in November 2009 and played well enough beat out three other players to cement the final spot as the youngest player on the US squad at the 2010 Paralympic Winter Games where the team shutout every opponent en route to a gold medal. Co-captain ... Has led the team in scoring nearly all season and currently has team highs in both points (17) and assists (13) ... Has six multi-point games ... Matched a career high with three points (1g, 2a) in 5-2 win over UNH on Jan. 11 ... Tallied two points in each of the first four games in November as part of a five-game point streak ... Recorded two goals, including game-winner, in 4-1 home win over Northeastern on Nov. 3 ... One of two collegiate players named to Team Canada's squad for the 2018 Spengler Cup ... Named to Spengler Cup All-Star Team after finishing tied for second on Team Canada in points with three on two goals and an assist. John Barr, creator of NHLtoSeattle.com and leader of the grassroots effort. "Congratulations, John," the tweet said. "We owe you all the stick taps." The Seattle Thunderbirds of the Western Hockey League retweeted it. Oak View Group, the company redeveloping the former KeyArena, quoted the tweet and added its own thank you from its Seattle account. So did the Western Washington Female Hockey Association and others. Barr quoted the tweet too. He said it made him cry. He thanked his 11,000 followers for being part of the journey and told them they had fueled his conviction. Olly Postanin and Jacob Ardown are hockey’s newest characters. The “On the Bench” boys have hit new found fame thanks to their video series of misleading hockey how-to’s. “We tried to key on the stereotypes of being Canadian and just throw them on the characters and just build off of it,” Ardown said. 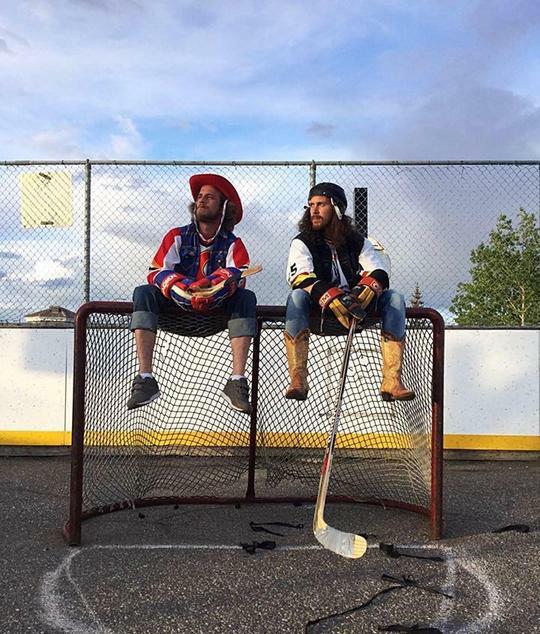 The two men under all that heavy Canadian garb, are Steven Campbell (AKA Olly) and Ryan Russell (AKA Jacob), two buddies from Airdrie, Alta., who tested the hilarious personas out on while coaching minor hockey. “It’s just really who we are as people,” Russell said. “As we were coaching we wanted to put fun back in the game, make the kids happier, compete a little bit harder. It seemed to work in practice so we started to film it.” And then one April night – it all sparked. Literally. And they certainly did. Since their first video was posted in March – their hockey “advice” has been watched by millions of people around the world. “I still really don’t think it’s sunk in,” Campbell said. Olly and Jacob have even broken into the National Hockey League circle, where the players have become fans. “I think the craziest part is when they come up to us and ask us for pictures, rather then us asking them,” Campbell said. “To have them approach us is crazy.” Johnny Gaudreau from the Calgary Flames, New York Islanders forward Jordan Eberle, Jack Eichel from the Buffalo Sabres and Drew Doughty from the LA Kings, Jeff Carter and Kyle Clifford are just some of the names who have now made a cameo appearances. The NHL even brought the duo out to New York before the season for media day. “It comes right from the dressing room, I mean everybody abbreviates everything, adds an ‘i-e’ or ‘y’ to it, and we kind of just took it over the top and put it on every single word that you would not put it on,” Russell said. But it makes you wonder if they’re running low on fundies to share. “Never, the fundies you can never run out of, ” Campbell said. Great news for the constantly growing legion of On the Bench followers. The laughs will keep on coming. 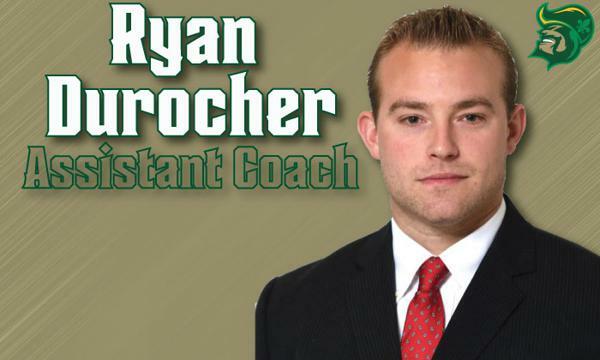 SIOUX CITY, IA—The Musketeers announced the hiring of Ryan Durocher as the team’s new Assistant coach on Wednesday morning. 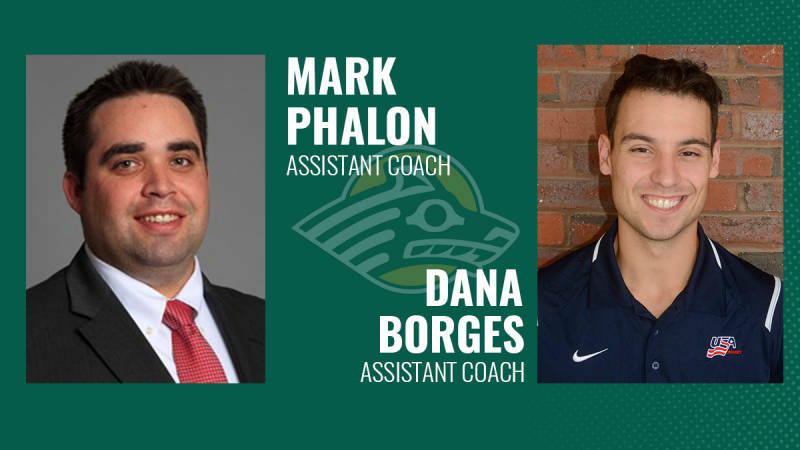 The Canton, NY native joins the Musketeers after having spent last season as the video coach for the Binghamton Devils of the American Hockey League. Before his time with the Devils, Durocher worked for the St. Lawrence University Men’s hockey team as an assistant coach and video coach. He has also coached for the New England Wolves of the EHL Premier league as well as Southern New Hampshire University where he was part of the staff that led the Penmen to their first NE-10 title in school history. During his time at Southern New Hampshire Durocher was also able to acquire his master’s degree in Sports Management with a concentration in Athletic Administration. Prior to his coaching career, Durocher played Division III hockey at SUNY Cortland, where he graduated in 2012 with a bachelor’s degree in Sports Management. Musketeers fans will get their first chance to see Ryan and the Musketeers in action during the preseason when the Musketeers take on the Tri-City Storm on September 15th as part of the I-80 cup at Ralston Arena in Omaha. The Musketeers will have three more preseason games before starting the regular season against the Green Bay Gamblers on September 28th as part of the 2018 USHL Fall Classic in Pittsburgh, Pennsylvania. The Musketeers will open their home schedule on Saturday, October 20th against the Waterloo Black Hawks. Single game tickets go on sale October 1st and season tickets are available now. For more information visit Musketeerhockey.com, email info@musketeerhockey.com, or call (712)252-2116. Georges Edy Laraque (French pronunciation: ​[ʒɔʁʒ laʁak]; born December 7, 1976) is a Canadian sports commentator, politician, and former ice hockey player. Laraque previously retired from hockey on August 10, 2010, after the Montreal Canadiens bought out his contract. He is a commentator for TVA Sports and most recently executive director of the fledgling Canadian Hockey League Players' Association. During his 14-year National Hockey League (NHL) career, he played for the Edmonton Oilers, Phoenix Coyotes, Pittsburgh Penguins, and Montreal Canadiens. From 2010 to 2013, he was one of two deputy leaders of the Green Party of Canada. Laraque entered the Quebec Major Junior Hockey League (QMJHL), where he played for a variety of teams. 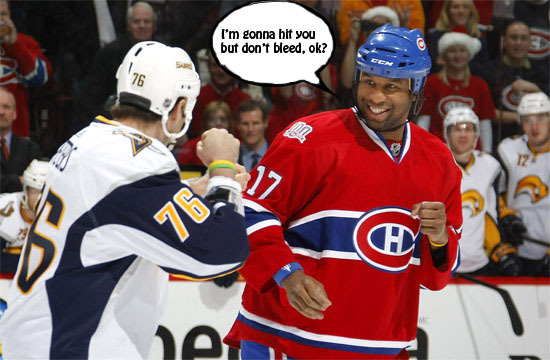 In 173 games at the junior level, Laraque stockpiled 107 points and 661 penalty minutes. Laraque was a member of the 1996 Granby Prédateurs team which won the Memorial Cup. After finishing junior, Laraque spent parts of two seasons with the American Hockey League's (AHL) Hamilton Bulldogs. On October 25, 1996, Laraque was involved in his first professional fight taking on Chris LiPuma of the Kentucky Thoroughblades. On September 15, 1997 in a pre-season game, Laraque fought established heavyweight fighter Donald Brashear of the Vancouver Canucks in an attempt to impress the coaching staff. On November 15, 1997, Laraque was called up to the NHL and took part in his first career fight against Todd Simpson of the Calgary Flames. Laraque won the fight and would be victorious in four others before being reassigned to the AHL. A year later, with much hard work to improve his game, Laraque showed enough at the AHL-level for Edmonton to bring him to the NHL on a regular basis. Although he was something of a power forward in junior hockey, Laraque is considered primarily as an enforcer at the NHL level. His 6'3" frame and his habit of fighting made him one of the most feared forwards in the league. He was unanimously awarded the 'Best Fighter' award from The Hockey News in 2003. He was named the number one enforcer by Sports Illustrated in 2008. Despite his reputation as a fighting-only player, Laraque has had offensive bursts during his career and on February 21, 2000, Laraque scored a hat trick against the Los Angeles Kings and was also named the game's first star. Laraque with the Penguins in April 2008 During the 2004–2005 NHL lockout, he played in Sweden, signing on with AIK. The following season with the Oilers, on November 23, 2005 in a game against the Minnesota Wild, Laraque defeated the 6'7" 260 pound Derek Boogaard. In the 2006 off-season, Laraque was up for free agency and wanted to stay in Edmonton and play. He even said he was willing to take a salary cut if the Oilers accepted on giving him a long-term, no-trade clause deal. The Oilers did not agree with Laraque's demand for a no-trade clause thus the contract was never signed. On July 5, 2006, Laraque signed with the Phoenix Coyotes. He scored his first goal as a Coyote against Edmonton on October 26, 2006. Laraque was then traded to the Pittsburgh Penguins for the 2007–08 season for agitating prospect Daniel Carcillo. Laraque's former junior coach and Penguins coach at the time Michel Therrien was heavily involved in this decision and believed that he was needed to protect the young stars in Sidney Crosby and Evgeni Malkin. Laraque pictured during his time as a member of the Montreal Canadiens On July 3, 2008, Laraque signed a contract as a free agent with the Montreal Canadiens. He elected to wear number 17 with the Canadiens rather than his usual 27, which was Alex Kovalev's number at the time. One of the main reasons why Montreal sought Laraque was to add toughness; in the previous year's playoffs, they had been outplayed physically by the Philadelphia Flyers, and in the first round, they had difficulty countering Boston Bruin Milan Lucic. On November 21, 2009 Laraque was suspended 5 games after hitting Detroit Red Wings defenseman Niklas Kronwall with a knee to knee hit. On December 12, 2009, Laraque would enter his final fight taking on Eric Boulton of the Atlanta Thrashers. On January 21, 2010 the Montreal Canadiens released Laraque and announced they were planning to buy out the remainder of his contract. His contract was officially bought out on June 15, 2010. Because Laraque had been suffering from two herniated discs in his back during the last season and a half that he had been playing, he subsequently announced his retirement from professional hockey. Laraque took advantage of being released by the Canadiens to offer his help to Haiti, his country of ancestry, and began raising money to rebuild the Grace Children's Hospital in Port-au-Prince, Haiti, in association with World Vision and the NHLPA. 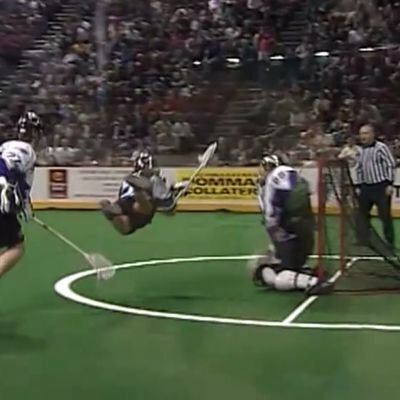 While playing with the Oilers, Laraque was famous for his "Laraque Leap", in which he would smash his body against the glass at Northlands Coliseum after the Oilers scored a goal. Laraque came out of retirement in January 16, 2015, joining Norway's Lokomotiv Fana, where he played two games before retiring again. Additionally, he was the assistant coach of the Haiti street and ball hockey national team during the 2015 Streethockey World Championship in Zug, Switzerland. Patrick Gerald Elynuik (born October 30, 1967) is a Canadian retired professional ice hockey player who played 506 games in the National Hockey League. After winning a Memorial Cup as a member of the Prince Albert Raiders in 1985, he was drafted in the first round of the 1986 NHL Entry Draft, 8th overall by the Winnipeg Jets. He also played his career for the Washington Capitals, Tampa Bay Lightning and Ottawa Senators. He retired in 1997. Since retiring from the NHL, Pat Elynuik Hockey Development is dedicated to making a difference in the quality of player development in the Calgary area. We focus on the successful criteria necessary to build successful players. We are effective in producing results for the development of players because we have played at the highest level. Having played in the NHL for 10 years, I have the knowledge and acess of NHL information that I can pass on to our players. Also note all my on-ice coaches have played NHL, AHL, WHL, NCAA Div 1. Jordin John Kudluk Tootoo MSM (Inuktitut: ᔪᐊᑕᓐ ᑐᑐ; born February 2, 1983) is a Canadian former professional hockey player. His final contract was played with the Chicago Blackhawks of the National Hockey League (NHL). Tootoo has previously played for the Nashville Predators, Detroit Red Wings and New Jersey Devils. Of Inuit and Ukrainian descent, he is both the first Inuk player and the first player to grow up in Nunavut to participate in an NHL game. 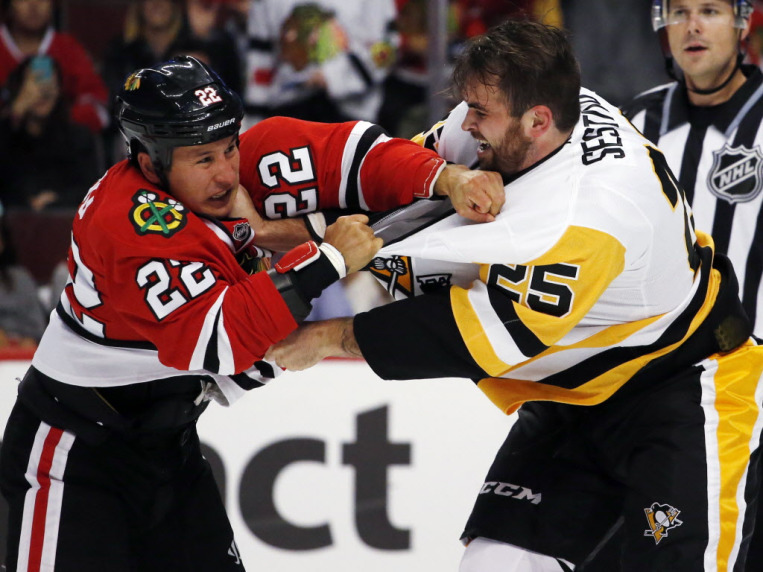 Tootoo was widely regarded as one of the NHL's best active agitators and was able to annoy, fight, and distract other players to help his team win. Nearing the end of the 2016–17 NHL season, Tootoo has accumulated 64 goals, 96 assists and 1008 PIMs in 717 career NHL games since entering the league in 2003. In addition to his on-ice skills, Tootoo is known for his charity and community outreach work, especially in northern communities. On October 19, 2018, he officially announced his retirement on Twitter, saying "After 220 regular season games with the Wheat Kings and 723 games in the NHL I have decided to retire from the NHL to focus on giving back to the Indigenous community." Welcome to the NHL, Theo Fleury drinking from the Stanley Cup after winning in his rookie season in 1989. I remember, do you? Theoren Wallace "Theo" Fleury (born June 29, 1968) is a Canadian former professional ice hockey player. Fleury played for the Calgary Flames, Colorado Avalanche, New York Rangers, and Chicago Blackhawks of the National Hockey League (NHL), Tappara of Finland's SM-liiga, and the Belfast Giants of the UK's Elite Ice Hockey League. 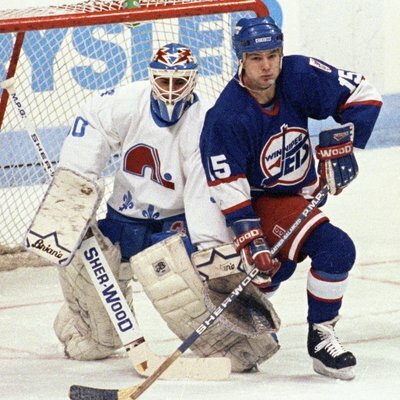 He was drafted by the Flames in the 8th round, 166th overall, at the 1987 NHL Entry Draft, and played over 1,000 games in the NHL between 1989 and 2003. One of the smallest players of his generation, Fleury played a physical style that often led to altercations. As a junior, he was at the centre of the infamous Punch-up in Piestany, a brawl that resulted in the disqualification of both Canada and the Soviet Union from the 1987 World Junior Ice Hockey Championships. Once considered unlikely to play in the NHL due to his small size, Fleury scored over 1,000 points in his career, placing him 61st in career NHL scoring and won the Stanley Cup in 1989 with the Flames. During his career Fleury recorded 90+ points four times in his career and 100+ points two times within his career. He twice represented Canada at the Winter Olympics, winning a gold medal in 2002. Throughout his career, he battled drug and alcohol addictions that ultimately forced him out of the NHL in 2003. He played one season in the British Elite Ice Hockey League in 2005–06, and made two attempts to win the Allan Cup. After an unsuccessful NHL comeback attempt with the Flames, he retired in 2009. Outside of hockey, Fleury overcame his addictions, operated a concrete business in Calgary with his family, and filmed a pilot for a reality television show about it. He marketed his own brand of clothing, which led him to play two professional baseball games for the Calgary Vipers of the Golden Baseball League. In 1995, he was diagnosed with Crohn's disease, and his annual charity golf tournament has helped raise more than $1 million for the Crohn's and Colitis Foundation of Canada. Fleury co-wrote Playing with Fire, a best-selling autobiography released in October 2009, in which he revealed that he had been sexually abused by former coach Graham James. Fleury filed a criminal complaint against James, who subsequently pleaded guilty to charges of sexual assault. Fleury has since become an advocate for sexual abuse victims and developed a career as a public speaker. He was a recipient of the Indspire Award in the sports category in 2013. Additionally, Theoren hosts the “Theo Fleury 14 Hockey Camp” which helps to teach, inspire and educate young hockey players ages 6 to 16. Moreover, Fleury travelled to Vancouver in 2013 where he assisted and co-hosted the 19th Annual Aboriginal Achievement Awards. Lalande played junior hockey in the Ontario Hockey League for the Belleville Bulls and was drafted 128th overall by the Calgary Flames in the 2005 NHL Entry Draft. 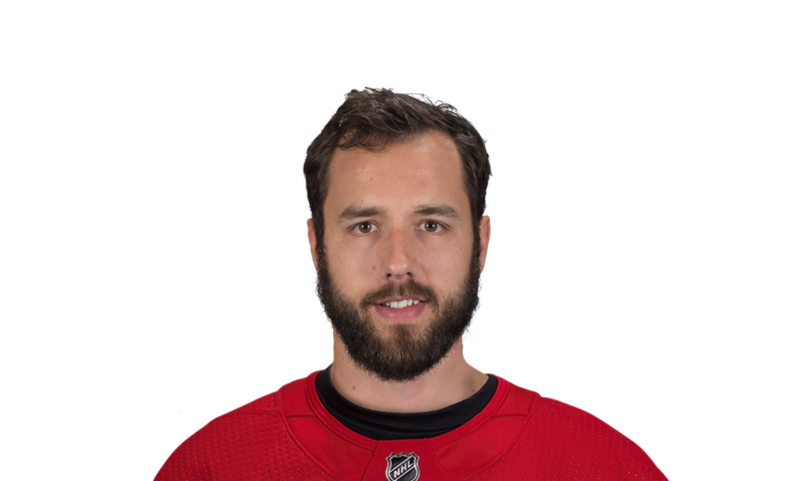 He joined the organization in 2007, splitting his time with the Flames' American Hockey League affiliate the Quad City Flames and their ECHL affiliate the Las Vegas Wranglers. He was traded to the Columbus Blue Jackets on March 4, 2009 and was assigned to their AHL affiliate the Syracuse Crunch. In 2010, Lalande signed with Vityaz Chekhov of the Kontinental Hockey League. In 2011, Lalande decided to continue his career with HC Dinamo Minsk, also a member of Kontinental Hockey League. On February 16, 2013 Lalande accepted Belarusian citizenship. Having suffered four concussions in the last 5 years of his 10-year professional career, Lalande ended his professional career at the age of 30 with Dinamo Minsk following the 2016–17 season. In his Olympic debut at PyeongChang 2018, defenceman Chris Lee helped Team Canada win the bronze medal. 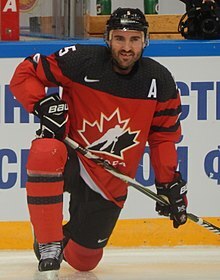 In the leadup to PyeongChang 2018, Lee played for Team Canada at the Channel One Cup and Karjala Cup in the fall of 2017. He had first worn the maple leaf in the spring of 2017 when he helped Canada win silver at the IIHF World Championship. Lee played collegiately for SUNY-Potsdam from 2000 to 2004. He then spent three seasons with the ECHL’s Florida Everblades. From 2006 to 2010 he played in the AHL with the Omaha Ak-Sar-Ben Knights, Iowa Stars, Bridgeport Sound Tigers, and Wilkes-Barre/Scranton Penguins. In 2010, he began playing in the Deutsche Eishockey Liga, spending a season with the Cologne Sharks before joining the Mannheim Eagles. He spent the 2012-13 season with Farjestads BK of the Swedish Elite League. In 2013-14 he moved to the KHL, playing the first of his five seasons with Metallurg Magnitogorsk, which included Gagarin Cup victories in 2014 and 2016. The guy behind, not literally, the goalie masks! 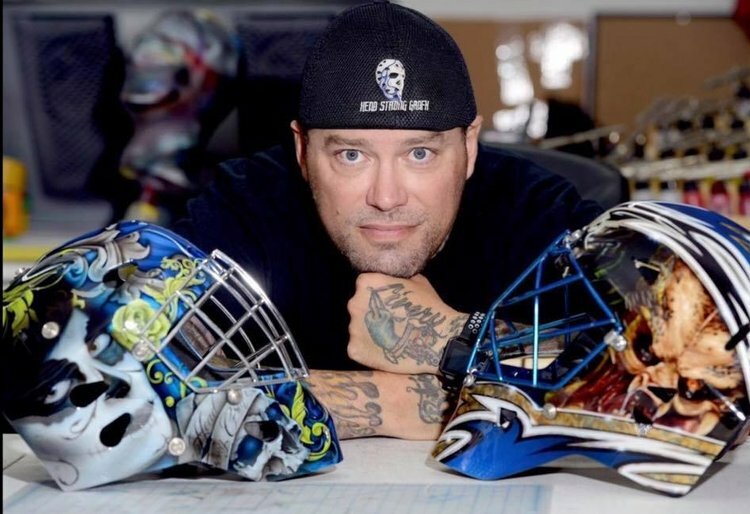 Listen to the owner of Head Strong Grafx explain the process of delivering an NHL caliber goalie mask. The creative and artistic process side of the business is interesting to listen to. Jason Livery is the #1 goalie mask artist in the USA currently residing in Mississippi. Head Strong Grafx is also a proud military owned business that takes years of world-renowned experience and embraces the challenge of displaying your passions, personality, and individuality, for all to see and praise. With masks painted for NHL goaltenders like Jake Allen and Scott Darling, as well as being the official mask painter of the NAHL, Head Strong Grafx is seen as one of the premier goalie mask painting companies among top goaltenders. The original goon. Doug "Smitty" Smith is a unique story to say the very least. First started skating at 19 and by the age of 21 played his first organized game. 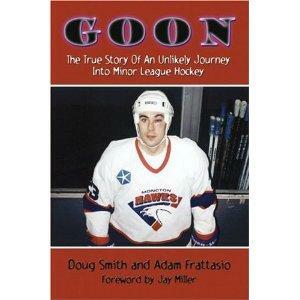 By 24 was playing minor league hockey as a fighter, the original goon! 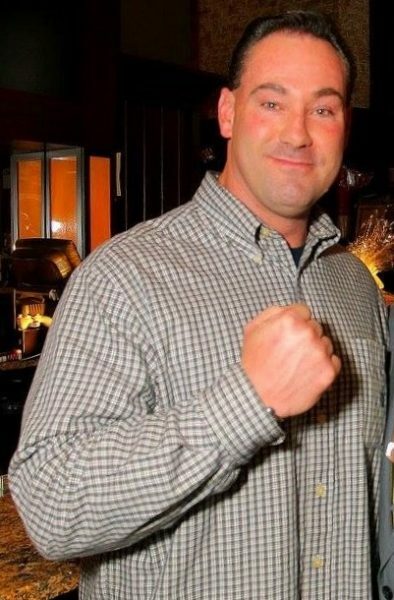 Smith's athletic career started with boxing, which culminated in a split-decision loss in the Massachusetts heavyweight Golden Gloves final in 1984. While training at the Hanover Police Boys' Club, his friend, Adam Frattasio, encouraged him to try hockey fighting. 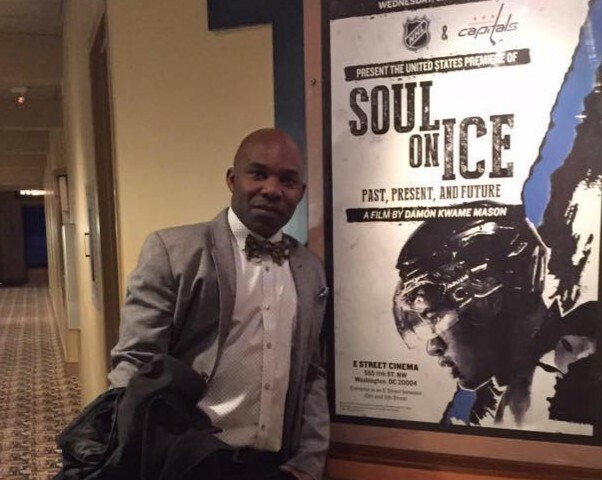 He first laced up skates at the age of 19, played in amateur leagues at 21, and made his first minor-league hockey team at 24 when he won a championship with the Carolina Thunderbirds of the first-year East Coast Hockey League during the 1988-89 season. Smith went on to play for six other teams in three leagues, his most productive tour being with the Miramichi Gagnon Packers of the New Brunswick Senior Hockey League. Smith received additional invitations to continue playing in the States, particularly to finish out seasons for teams in various lower minor-leagues, but his new job as a police officer in Massachusetts limited his opportunities to participate in sporadic games with the intention of fighting the opponent's toughest player(s). After retiring from hockey, Smith has worked as a coach within the Boston Bruins organization, showing their players how to defend themselves. He enjoyed a 20-year stint as an assistant coach for the three-time state-champion Hanover High School hockey team, and has logged significant time as an on-ice official, including two years patrolling the ice in the professional Federal Hockey League. He continues to work as an on-ice hockey-fight trainer, working with such NHL heavyweights as Steve MacIntyre and John Scott. Additionally, Smith is a police officer, currently with the Hanson police department since 1999. Smith is married and helps care for his two young daughters with his wife, Sharon. Happy Thanksgiving edition of our podcast. Listen to the boys talk about current headlines, coaches being fired and hired, suspensions, and much more. Thanks for listening to episode 36. Flanagan has spent the past three seasons playing in the Senators organization and last season tallied a goal and three assists in 17 games with Belleville. Over the course of 205 career AHL games, where he also played for Adirondack, he notched 23 goals and 82 points. More information on Flanagan below. CANTON -- Hockey has taken Kyle Flanagan across the country and even overseas, but he always seems to end up back at home in Canton. Flanagan recently retired from hockey after a six year professional career, playing for several American Hockey League teams and even a season in Sweden. The 29-year-old forward is happy that his career allowed him to play against elite competition, with some of his most treasured fans in the crowd to cheer him on. “The most meaningful aspect of my career was that I played at some of the highest levels of hockey so close to home in front of family and friends and had a lot of fun doing it,” Flanagan said. Flanagan played high school hockey for the Canton Golden Bears form 2004 to 2007 before beginning his more committed hockey journey. His first stop was with the Cornwall Colts, a Junior A team just over the Canadian border. Flanagan then spent the next two seasons in Iowa playing for the Cedar Rapids RoughRiders of the United States Hockey League before beginning his four year college career at St. Lawrence University. The Canton native was an obvious fan favorite when the Saints stepped on the ice. Flanagan amassed 46 goals and 101 assists in 134 games and was named a finalist for the Hobey Baker Memorial Award his senior season. He was offered a professional contract immediately after his senior campaign ended in 2013 and began playing for the Adirondack Phantoms. 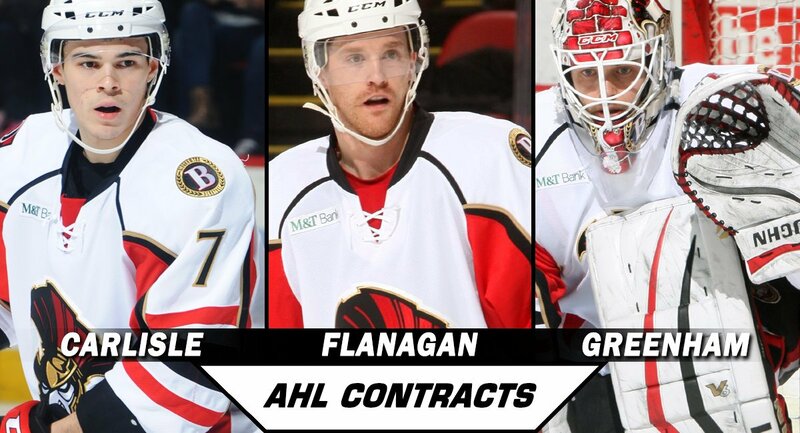 Flanagan played two seasons with Adirondack before signing with Swedish Hockey League team MODO Hockey Ornskoldsvik, where he played for one season before returning to play three more years in North America with Adirondack and the Binghamton Senators, who moved to Belleville, Ont. in his final season. Naturally, Flanagan said he would love to continue playing the game he loves, but seems at peace with his decision to retire. Although he is not sure what his next career move will be, a future in hockey is still on the table. And, again, Flanagan has landed in Canton. Hockey still continues to be part of his reality there. During the summer, Flanagan teams up with fellow Canton native and professional hockey player Wade Megan and former NHL video coach Mark Phalon to run the NoCo Hockey Skill Camp, which offers innovative skill development to hockey players in the North Country. Canton is home to Flanagan, Megan and Phalon, and they intend to have an impact on the way the next generation of hockey talent is formed there. It is not lost on Flanagan that many of these young hockey players he works with look up to him. He hopes that when those kids saw him play, they saw him enjoying the game, being creative, and making a commitment to never be outworked. “If someone looked up to me as a role model from watching me play, I would want them to chase their dreams but don’t obsess over them, have fun, work hard, and let the chips fall into place,” Flanagan said. The NoCo Hockey Skill Camp will be held twice next summer at SUNY Canton’s Roo’s House. The first week will be held Monday through Friday, July 29 to Aug. 2, 2019. The second week starts Monday, Aug. 5, and goes through Friday, Aug. 9, 2019. Players ages 12 to 18 years old can register for camp online starting Friday, Aug. 31, 2018. Trent talks with the boys about transitioning to professional hockey from (NCAA) U. Wisconsin. Now playing for the Providence Bruins, Trent "Freddy" Frederic is working to earn a spot in the NHL with Boston. We'll be watching this kid! 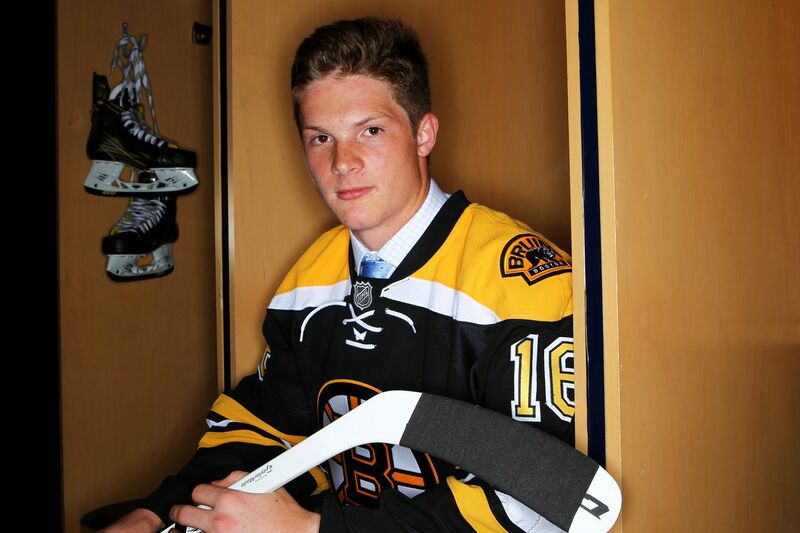 If there were any question forward Trent Frederic was the type of player who would interest the Boston Bruins in the 2016 NHL Draft, it was answered when the St. Louis native was skating for USA Hockey's National Team Development Program Under-18 team late last season. The Bruins became enamored with Frederic's attention to detail and intangibles. 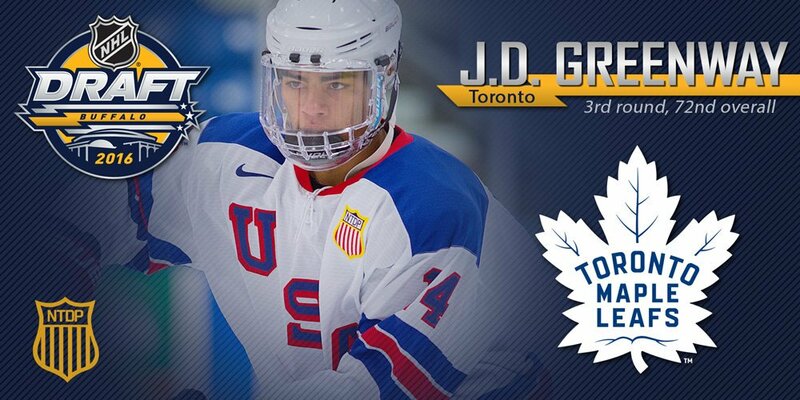 They also loved his ability to provide offense, with 14 points in 23 United States Hockey League games for the NTDP, and seven points in seven games during the NTDP's run to the bronze medal at the 2016 IIHF World Under-18 Championship. But there was more. Prior to the U-18 World Championship, Frederic blocked a shot in a game and broke his hand. It hurt, but he didn't know it was broken so he kept playing. He was a point-per-game player in that tournament, all while showing the Bruins the type of grit and perseverance in the face of pain that has been the hallmark of many of the organization's greats over the years. "I was putting some Icy Hot on it," Frederic said during Bruins development camp at Ristuccia Arena. "I kind of changed the grip on my stick. I wasn't going to miss that tournament so it didn't matter." When the season ended, Frederic saw a trainer and went about getting his hand healed. He was off skates for about a month and he wasn't able to do pull-ups at the NHL Draft Combine. But he already had shown the Bruins what they wanted to see. Frederic's toughness has since been tested in other ways. He was ranked 47th in the NHL Central Scouting's final ranking of North American skaters, but the Bruins selected him No. 29 in the draft. 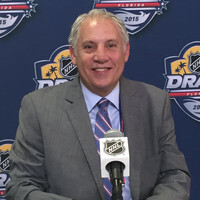 Bruins director of amateur scouting Keith Gretzky didn't do Frederic any favors after the draft, when he described the 18-year-old as someone who "is not going to be a top-two line guy." Frederic didn't let anyone's words get him down any more than his broken hand did. Kenny Rausch joined the USA Hockey staff full-time in June 2009. As director of youth hockey, Rausch helps oversee USA Hockey’s youth hockey department and programs, the youth and high school national championships, and all national player development camps. As part of his work at the development camps, he serves as the GM of the U.S. Under-17 team that competes in the Under 17 Five Nations Tournament and assists in coordinating the Under-18 Select Team that competes at the Ivan Hlinka Memorial Tournament. Prior to joining USA Hockey on a full-time basis, Rausch coached at numerous USA Hockey Boys' Select Player Development Camps, and was an assistant coach for the U.S. Under-18 Select Team at the 2004 and 2005 Junior World Cups (Ivan Hlinka Memorial Tournament). Rausch’s coaching experience expands well beyond USA Hockey. He spent the 2008-09 season as an assistant coach at Babson College, helping lead the Beavers to the 2009 ECAC East Championship. Previously, he served as an assistant coach and recruiting coordinator at the University of Massachusetts Lowell from 2001-08. While there, Rausch recruited a Hobey Baker finalist, a Hockey East Rookie of the Year, multiple Hockey East All-Stars, an All-Rookie Team member, and an All-American. Prior to Lowell, he spent three years at Niagara University, where he was part of the first CHA championship team that went undefeated in league play and knocked off the University of New Hampshire in the 2000 NCAA Ice Hockey Tournament. Recruits at Niagara included a Hobey Baker Finalist, two CHA Players of the Year, and multiple league All-Stars. Before Niagara, Rausch spent one year at Colby College. His first year of coaching was in the 1996-97 season, as an assistant coach for his alma mater, Boston University. He helped lead the Terriers to the Beanpot and Hockey East titles that year. As a player, Rausch was a four-year member of Boston University's men's ice hockey team from 1991-95. He was a part of the 1995 team that won the NCAA Division I National Championship, the Hockey East regular season title and the Hockey East Tournament, as well as the Beanpot, where he was named the Beanpot Most Valuable Player. Rausch was a four-year member of the Hockey East All-Academic Team and was a Hockey East Distinguished Scholar Award Winner. "Welcome back hockey moms!" 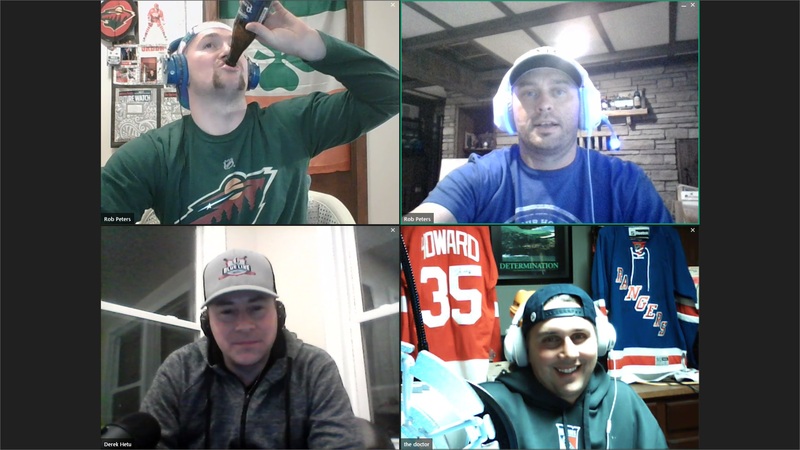 Listen to the boys talk about which coaches could potentially be on the chopping block, team mascots, teams that are hot and those that are not! Lashoff prepped at Avon Old Farms School in Avon, Connecticut under famed coach John T. Gardner. He was drafted by the Boston Bruins in the first round, 22nd overall, in the 2005 NHL Entry Draft. After playing three seasons in the Ontario Hockey League with the Kitchener Rangers, Lashoff made his professional debut at the end of the 2005–06 season with the Bruins' American Hockey League affiliate, the Providence Bruins. 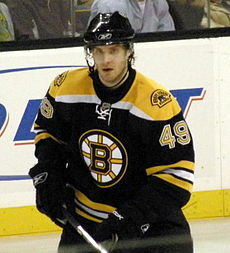 Lashoff made his NHL debut with the Boston Bruins in the 2006–07 season on October 26, 2006. Lashoff scored his first NHL goal December 31, 2007, against Kari Lehtonen of the Atlanta Thrashers. On April 4, 2007, Lashoff was named to the 2006–07 AHL All-Rookie Team. On March 4, 2009, at the trade deadline for the 2008–09 season, Lashoff was traded by the Bruins, along with Mārtiņš Karsums, to the Tampa Bay Lightning for Mark Recchi and a 2009 second round draft pick. On August 27, 2010, Lashoff was traded by the Lightning to the Toronto Maple Leafs in exchange for Alex Berry and Stefano Giliati. On August 3, 2012, as a free agent, Lashoff signed a try-out contract with European team, ZSC Lions of the Swiss NLA. After two and a half years abroad in Sweden and Russia, Lashoff left Metallurg Novokuznetsk of the Kontinental Hockey League mid-year in the 2014–15 season, to return to North America to sign an AHL contract for the remainder of the campaign with the Bridgeport Sound Tigers on January 12, 2015. Lashoff appeared in just 11 games with the Tigers before he was traded to the Portland Pirates in exchange for Dyson Stevenson on March 3, 2015. Lashoff agreed to join the Lehigh Valley Phantoms to begin the season on October 5, 2015. In adding depth to the blueline, Lashoff appeared in 17 games for 2 assists before he was released from his contract. On February 2, 2016, Lashoff inked a contract for the remainder of the 2015–16 season with Adler Mannheim of the German top flight Deutsche Eishockey Liga. He appeared in 3 regular season games before suiting up in two post-season contests, contributing with a goal and 14 penalty minutes. As a free agent in the following off-season, and having returned to North America from Germany, Lashoff trained and agreed to attend his former club, the Toronto Marlies training camp, in preparation for the 2016–17 season. He was released from his try-out during the pre-season on October 10, 2016. 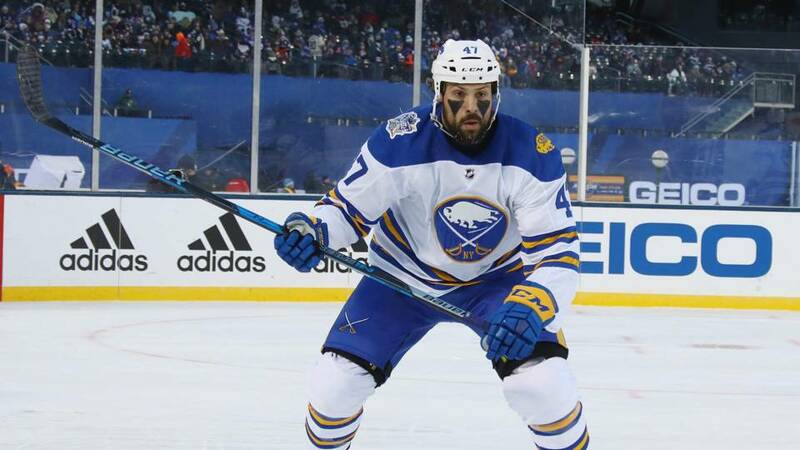 With the season underway, Lashoff belatedly agreed to a professional try-out contract with the San Antonio Rampage of the AHL, affiliate to the Colorado Avalanche, on October 26, 2016. In 19 games with the Rampage, Lashoff led the defense in scoring with 3 goals and 7 points. At the end of his try-out period, the Rampage however opted against another try-out contract concluding his tenure with the team on December 23, 2016. On February 3, 2017, he signed with the SCL Tigers of the National League A for the remainder of the 2016-17 season. 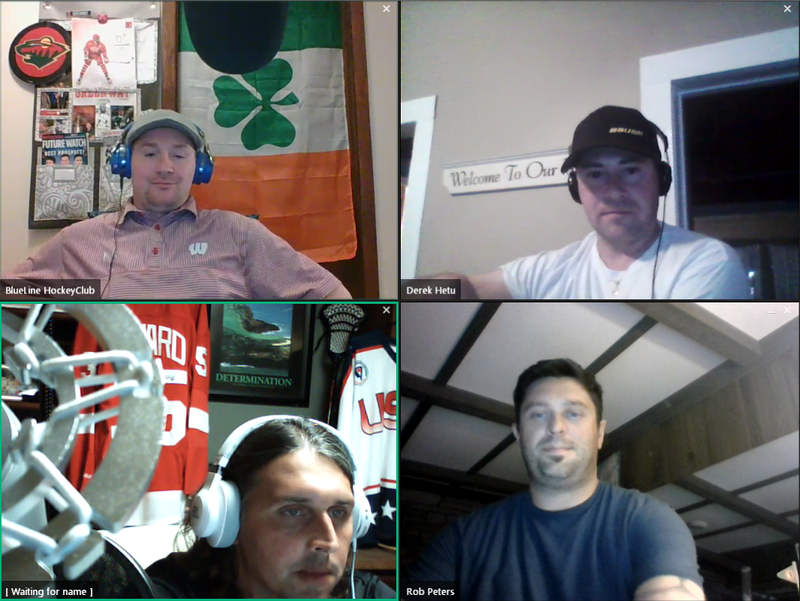 Clarkson Golden Knights Women's Head Coach Matt Desrosiers joins the boys to talk about his back to back national titles, Desrosiers 3rd overall. 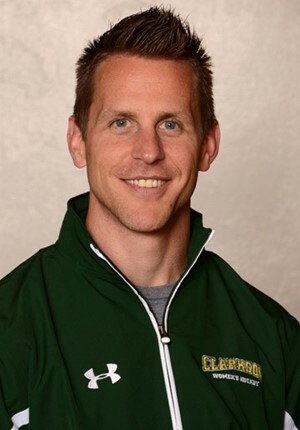 In his first 10 seasons as Clarkson University’s Head Coach, including the last four as the solo head coach for the Green and Gold, Matt Desrosiers has established the Golden Knights as one of the premier women’s hockey programs in the country. Desrosiers earned ECAC Hockey Coach of the Year honors for the third time this season. Under Desrosiers guidance, Clarkson has posted eight 20+-win seasons, including the past seven, four 30-win campaigns in the past five years, won four ECAC Hockey regular season titles, earned two conference tournament championships, made seven NCAA Tournament showings, including six straight, advanced to the NCAA Frozen Four four times and won it all with the 2014, 2017 and 2018 NCAA National Championships. Clarkson has posted a .711 win percentage since Desrosiers assumed the head coaching role in 2008, posting a 256-92-41 record under his watch. in 2017-18, Clarkson enjoyed its finest season ever with a 36-4-1 overall record, capped off by the program's second consecutive National Championship and the third NCAA title in the past five years. The Green and Gold also won both the ECAC Hockey Regular Season (19-1-2) and Tournament Championships in 2017-18. Clarkson won the program’s second National Championship last year to close out a 32-4-5 season, including a first-place 19-1-2 ECAC Hockey slate. The Knights also won their first ECAC Hockey Championship Tournament title in 2016-17. In 2015-16, Desrosiers guided the Knights to the 30-win mark for the second time in the 13-year history of the program and moved on to the NCAA Frozen Four for the second time in three years. Clarkson finished with 30-5-5 overall and battled for its third straight ECAC Hockey regular season title in 2015-16, finishing in second place, three points out of the top spot, with a 14-3-5 league mark. In his first year as solo head coach, Desrosiers continued to lead the Green and Gold to success in 2014-15, much as he did when he shared the coaching duties with his wife, Shannon, for the previous six years. Desrosiers, who served two years as an assistant on the Clarkson coaching staff from 2006-08 prior to being elevated to co-head coach in 2008-09, has enjoyed great success in guiding the Golden Knights. In 2014-15, Clarkson skated to a 24-11-3 overall record, claimed a share of the ECAC Hockey regular season title with a 16-4-2 conference mark, earned the number one seed in the league playoffs and made its third consecutive trip to the NCAA Tournament. In 2013-14 Clarkson reached the pinnacle of accomplishments in Division I women’s hockey when the Knights earned the University’s first-ever NCAA Championship. The Green and Gold won the ECAC Hockey Regular Season title with a 16-2-4 league mark and capped off a 31-5-5 overall record with a 5-4 victory over two-time defending national champion Minnesota in the NCAA Championship game on March 23 to complete Clarkson’s best season ever. In 2013-14 and 2014-15, Desrosiers and his staff won the ECAC Hockey Coach of the Year Award. Numerous players have gained all-star recognition under Desrosiers’ guidance, including Jamie Lee Rattray, who won women’s college hockey’s highest honor - the Patty Kazmaier Memorial Award in 2014. Senior Cayley Mercer was a Top 3 Finalist for the prestigious award in 2017, and Loren Gabel was a Top 3 Finalist in 2018. No stranger to ECAC Hockey or the North Country, Desrosiers played at St. Lawrence University and joined the college coaching ranks after playing professional hockey for several years. He has an exceptional hockey background, both in college and professionally, and is very familiar with ECAC Hockey. Desrosiers focuses on on-ice systems and is also greatly involved with recruiting. A four-year standout on defense at St. Lawrence from 1997-2001, Desrosiers helped the Saints reach the Frozen Four as a junior and gained ECAC and All-America honors as a senior. The Fort Erie, Ontario native was also named an ECAC Robbins Scholar Athlete of the Year in 2001. Desrosiers played five years of professional hockey after graduating from St. Lawrence in 2001. He played in two East Coast Hockey League (ECHL) All-Star games (2002, 2003) representing the Dayton Bombers and the South Carolina Stingrays. He played two seasons in the Central Hockey League (CHL) and helped lead the Colorado Eagles to the 2005 President’s Cup Championship. Matt and Shannon have a young daughter, Brynlee Matison, and a young son, Brodee. University of Michegan junior forward Nick Pastujov drops by to talk with the boys about the upcoming 2018-2019 season for the Wolverines. Michegan is ranked in the preseason at #4. The man, the myth, the LEGEND! NHL Hall of Fame goaltender, Grant Fuhr joins the boys to promote his new documentary Making CoCo! 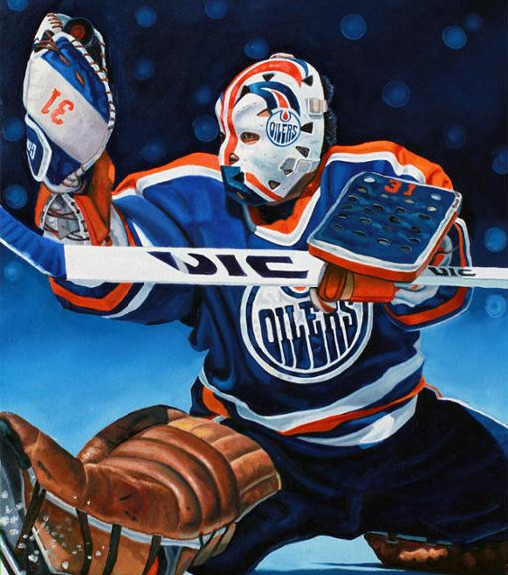 Whicked excited about our special guest next week the fabulous Grant Fuhr! You might know him as an Oiler, Blues, or a Sabres. You don't want to miss this interview. 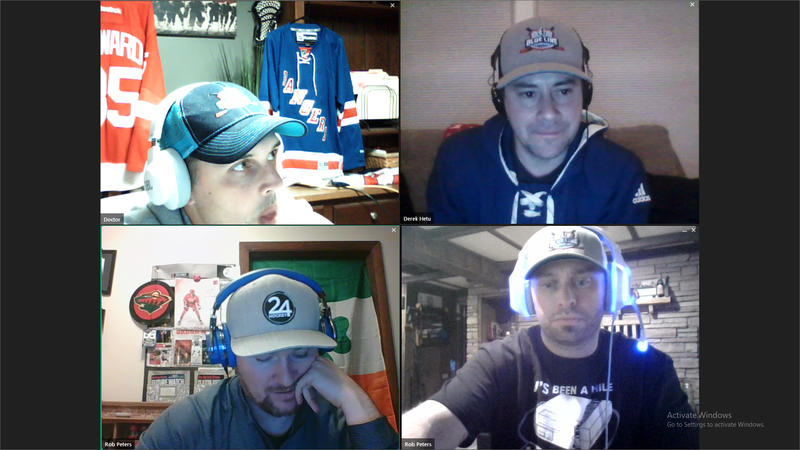 Adam joins the boys for some hockey talk. Listen to Adam explain how he got to HARVARD! This boys whicked smaught! Drafted in the third round (66th overall) of the 2016 NHL Entry Draft by the Calgary Flames. First team CCMM/AHCA All-America ... ECAC Hockey and Ivy League Rookie of the Year ... ECAC and Ivy first team ... ECAC Tournament and NCAA East Region tournament team selection ... Walter Brown Award semifinalist ... ECAC Hockey Rookie of the Month (March) ... All-ECAC Rookie Team ... Co-honoree of the George Percy Award as top rookie for the Crimson ... Led the team with 34 assists ... Led all defensemen in the nation in points per game (1.14) ... Skated in all 35 games ... Won a gold medal with Team USA at IIHF World Juniors ... Had eight points in the postseason, including an assist in each NCAA Tournament game ... Closed out regular season with at least a point in three-straight games (Feb. 18 - Feb. 25) ... Collected a score and an assist in win over Brown Feb. 18 ... Scored and added a helper in Beanpot Championship win against BU Feb. 13 ... Two assists in win over Dartmouth Feb. 3 ... Three-straight games with an assist (Jan. 17-21) ... Scored against Princeton Jan. 7 ... Recorded fourth consecutive multi-point game with two assists in win over Quinnipiac Jan. 6 ... Posted eight points, one goal and seven assists, in three contests between Nov. 26 and Dec. 3... Lended two helpers against then-No. 3 Boston College on Nov. 18... Tallied one assist against Princeton on Nov. 11 ... Contributed one assist on Nov. 5 against Cornell ... Added one assist against Colgate on Nov. 4 ... Earned one assist against Arizona State on Oct. 29 ... Tallied two assists against Arizona State on Oct. 28. 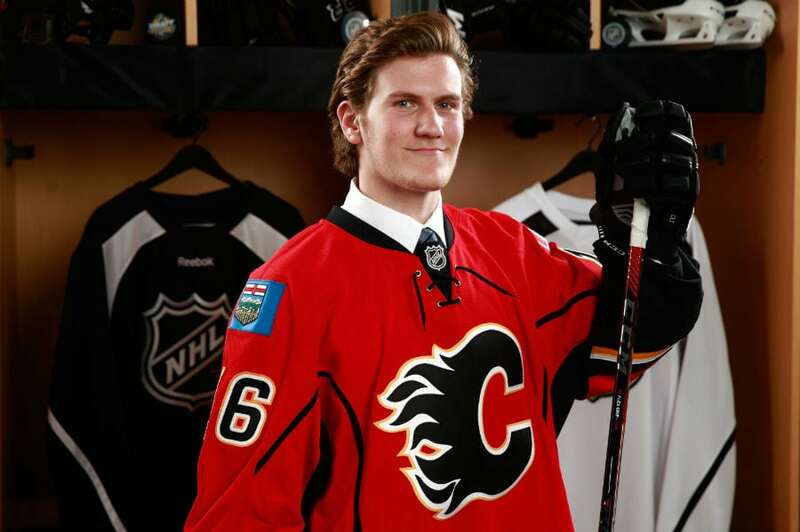 Selected in the third round (66th overall) of the 2016 NHL Entry Draft by the Calgary Flames … Defenseman for USNTDP from 2014-16 … Led all USNDTP Under-18 defensemen in goals, assists and points with 9-50—59 in 64 games in 2015-16 … Third all-time in points by a defenseman in USNDTP history … 2016 U18 World Hockey Championships Best Defenseman … 2016 U18 World Hockey Championships Media All-Star Team … Bronze medal at the 2016 Championships. 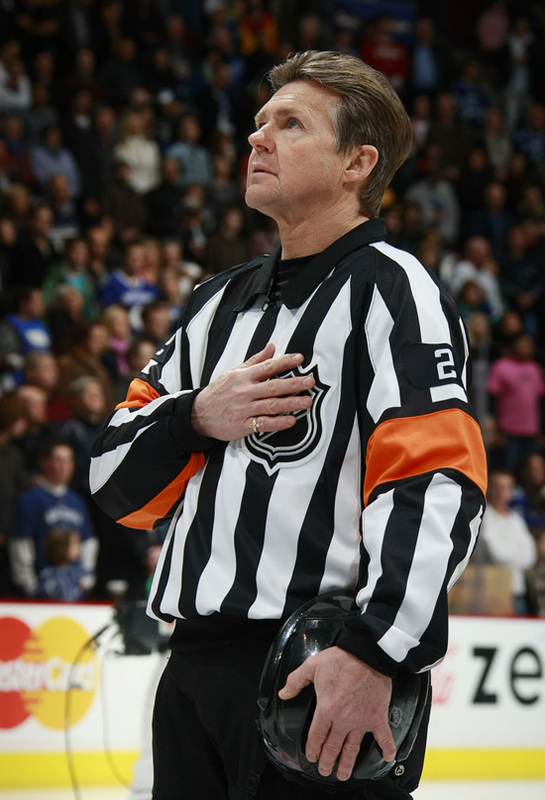 Kerry Fraser is a hockey analyst, broadcaster and former senior referee in the National Hockey League. During his career, he called 1,904 regular season games, 13 Stanley Cup Finals, and over 261 Stanley Cup playoff games. Brianna drops in to discuss her path to the top of Women's hockey! Decker left the boys amazed at her story. Simply put, she's awesome! 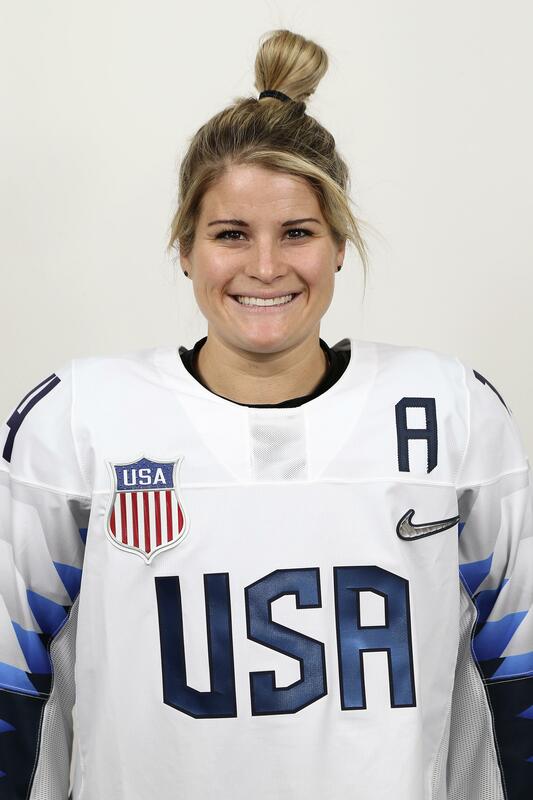 Recently signed with the Calgary Inferno of CWHL,(born May 13, 1991) is an American women's ice hockey player for the Boston Pride of the National Women's Hockey League. She is a member of the United States women's national ice hockey team. She was awarded the 2012 Patty Kazmaier Award while playing for the University of Wisconsin, recognizing the best female ice hockey player in NCAA Division I play. With the Boston Pride, Decker would score the first hat trick in NWHL history on October 25, 2015. The next ambassador of lacrosse? WE THINK SO! 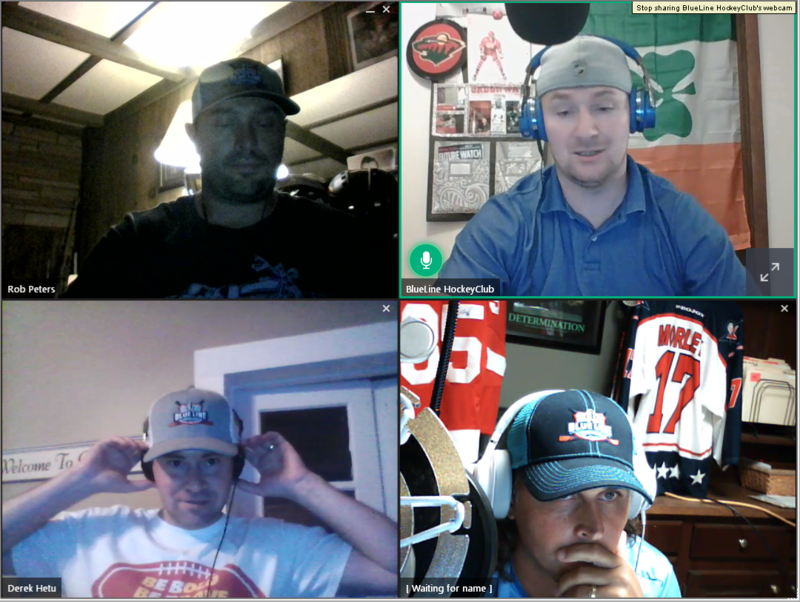 Mike Benedict Jr. drops in to talk with the boys about lacrosse in NNY and Canada. St. Regis Braves have named Mike Benedict Jr. as new head coach for the 2018 season. He takes over a team who finished 18-12 overall last season, finishing fourth at Presidents' Cup. A 1999 graduate of Salmon River Central School, Benedict went on to play professionally for nine seasons (1995-2003). Terry, a fifth-round pick (No. 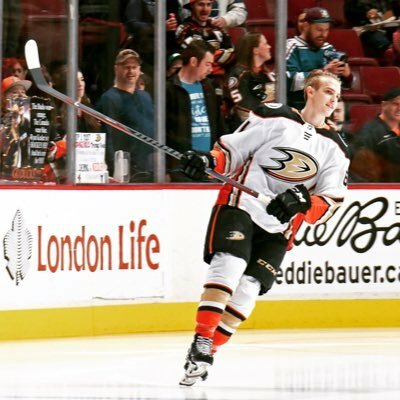 148) in the 2015 NHL Draft, made his NHL debut with the Anaheim Ducks on March 27, 2018, after a decorated amateur career that included three seasons at the University of Denver. The 20-year-old forward had three shots on goal in two games. Terry starred with USA Hockey's National Team Development Program, and had five points (three goals, two assists) to help the United States win the gold medal at the 2015 IIHF World Under-18 Championship. Coach Smith, head coach of RPI Men's Hockey, steps off the fishing boat for a few minutes to talk to the boys. Check out what he had to say about RPI! 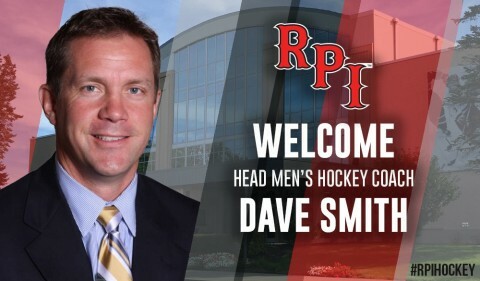 Smith comes to Rensselaer after spending 12 years as the head men's hockey coach at Canisius College. He led the Golden Griffins to three-straight trips to Atlantic Hockey Championship weekend for the first time in school history, including consecutive appearances in the title game and the team’s first crown in 2013. During the 2012-13 campaign, Smith guided Canisius to the program’s first conference title with a 7-2 victory in the Atlantic Hockey Championship against Mercyhurst and the team’s first appearance in the NCAA Division I Tournament. 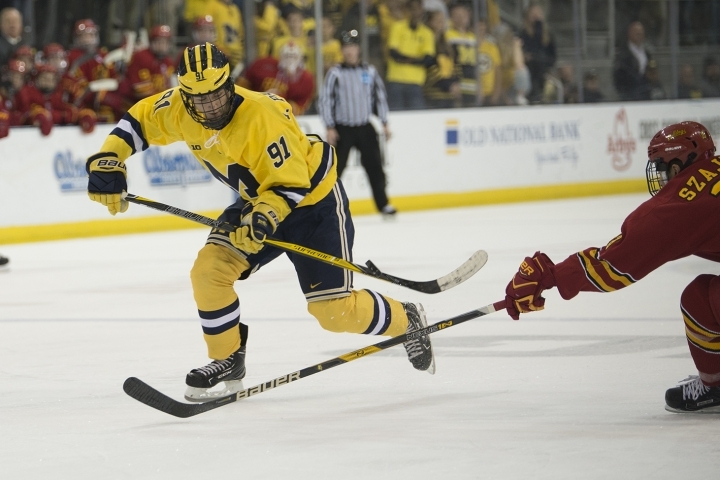 The Griffs also finished the campaign ranked 19th in the final USCHO.com national poll, marking the program’s highest finish in the national rankings. Canisius nearly duplicated the remarkable feat the following two seasons, advancing to the 2014 Atlantic Hockey title game after again eliminating the top two seeds in the conference tournament before earning a second-place finish in 2015 – matching the program’s best regular-season finish – and making a third-straight trip to the semifinals. In his first 11 seasons, 186 Griffs have earned Atlantic Hockey All-Academic accolades, including a school-record 23 following the 2013-14 campaign. In addition, Max Buetow (2005-06), Dave Cianfrini (2009-10), Ryan Bohrer (2011-12 & 2013-14), Stephen Miller (2012-13 & 2013-14) and Geoff Fortman (2014-15 & 2015-16) were named the Atlantic Hockey Top Scholar Athlete for owning the top GPA in the league. The hockey program consistently owns the top GPA of any team at Canisius with a 3.31 cumulative mark following the 2015-16 academic year. During his tenure as an assistant coach at Bowling Green and Miami, Smith coached or recruited two Hobey Baker Award Finalists, four Players of the Year, two Rookies of the Year, 22 all-league award winners and three Terry Flanagan Award winners for Perseverance. The Arthur, Ontario, native was also instrumental in guiding Mercyhurst to two league championships and two NCAA Division I Tournament appearances in his three seasons with the Lakers. Smith graduated from Ohio State University in 1992 with a bachelor’s degree in journalism/public relations and was a four-year letterwinner for the Buckeyes. Smith finished his career at Ohio State with 140 points, ranking 14th all-time. He was selected as team captain as a junior and chosen as the team’s MVP as a senior, while leading the Buckeyes with 41 assists and 63 points. 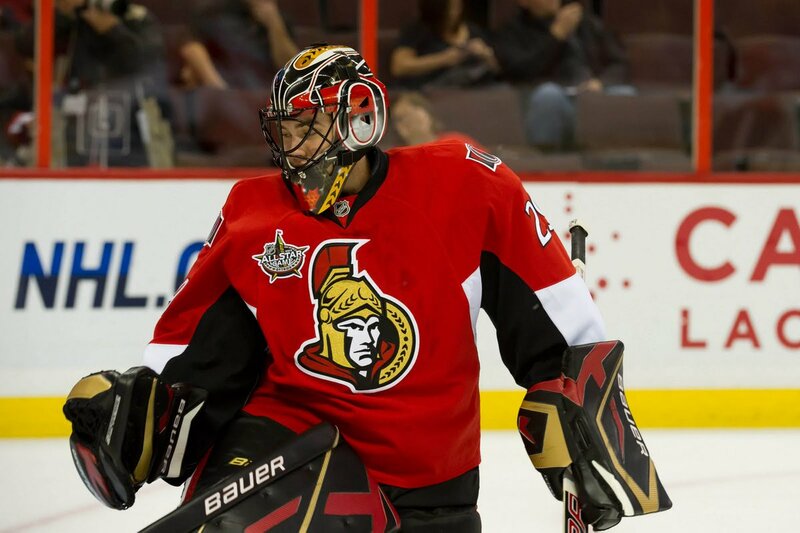 The Ottawa Senators (@Senators) announced today that the club has agreed to terms with goaltender Mike McKenna on a two-way, one-year contract. The contract will carry an annual value of $700,000 in the National Hockey League and $175,000 in the American Hockey League. McKenna, 35, returns to the Senators organization, where he played one season for the Binghamton Senators in 2011-12. McKenna, brings a wealth of experience, including 24 NHL games (Tampa Bay, New Jersey, Columbus, Arizona and Dallas) and 461 regular-season AHL games over 13 seasons. The St. Louis, Mo., native won 17 games while posting a 2.64 goals-against average for the Texas Stars last season, leading them to an appearance in the Calder Cup Final. That marked the second consecutive season his AHL team has make the Calder Cup Final, after doing so in 2016-17 with the Syracuse Crunch. Charlie interupts dinner with his agent to talk to the boys. Check out what he had to say. Stories for the times..! Born and raised in Long Beach, New York, McAvoy started skating at age 3 at Long Beach Arena, where his father, Charlie Sr., a plumbing and heating contractor, helped with installing a studio rink. He grew up a fan of the New York Rangers and Hockey Hall of Fame defenseman Brian Leetch, and attended Long Beach High School for one year before moving to Ann Arbor, Michigan, where he went to Pioneer High School and joined USA Hockey's National Team Development Program. 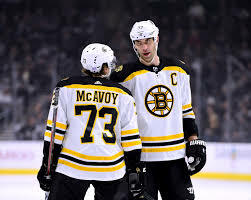 McAvoy spent two seasons with the NTDP, helping the United States win gold at the 2015 IIHF Under-18 World Championship, and joined Boston University as a 17-year-old freshman. In McAvoy's two seasons, the Terriers went 45-25-8 and made the NCAA Championship twice. McAvoy was named a CCM/ACHA First Team All-American as a sophomore, when he had 26 points (five goals, 21 assists) and was plus-9 in 38 games. Zach joins the boys to discuss his off ice training. The offseason trade moves the Sabres just completed. His outlook on this upcoming season, and more. Let's go Sabres! Selected by the Atlanta Thrashers with the No. 3 pick in the 2008 NHL Draft, Bogosian made the club out of training camp that year. When he made his NHL debut Oct. 10, 2008, against the Washington Capitals, he became the youngest player in Thrashers history at 18 years and 87 days. Bogosian broke his left leg Oct. 28, 2008, in a game against the Philadelphia Flyers and was out until January. He scored his first NHL goal Jan. 17, 2009, against Nashville Predators goaltender Pekka Rinne, and led rookie defensemen with nine goals that season. He followed it up by playing for the United States at the World Championship in 2009. 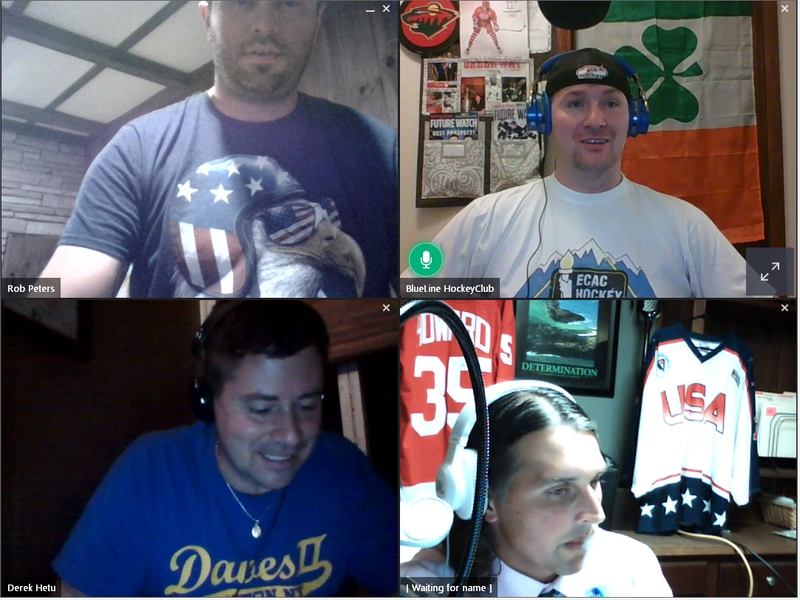 Wade Megan stops by to tell us about signing with the Detroit Red Wings, his plans for the summer, off ice training, Red Wings Camp, and more. Joe joins the boys from the Toronto Pro Camp. Listen to him describe what it's like to be competing for a potential opportunity to play for the Maple Leafs (no pressure! ), his thoughts on this past season with Boston College, and more. AS A FRESHMAN (2016-17): Played in and started 34 games … went 17-13-3 … registered a 2.64 goals against average and a .913 save percentage; went 11-5-3 with a 2.43 goals against average and a .916 save percentage in 20 Hockey East contests … tabbed the Bernie Berke Most Outstanding Freshman Award … named to the Hockey East All-Rookie Team … earned a spot as a Hockey East Honorable Mention All-Star … part of the U.S. National Junior Team that won the gold medal at the 2017 IIHF World Junior Championship in Montreal and Toronto, Canada (missed Dec. 29-30) … posted first-career shutout against Vermont in Game 1 of the Hockey East quarterfinals via 22 saves … posted a career best after stopping 42 shots to backstop BC to a victory over UConn (Jan. 24) … matched that mark against Boston University to help lift BC past the Terriers in the Hockey East semifinal (March 17) … steered away 40-of-41 shots against eventual national champion Denver to preserve his first victory as an Eagle (Oct. 8). BEFORE BC: Played for the US National Team Development Program in the 2015-2016 and 2014-2015 seasons … in 33 appearances tallied a 2.14 goals against average and .918 save percentage in 2015-2-16 … prior to the 2014-2015 season, played for St. Louis AAA Blues from 2012-2014 … earned a third place finish in Tier 1 National Championship both seasons… won the gold medal at the Five Nations Tournament in Finland … earned a bronze medal in the U18 World Championship. 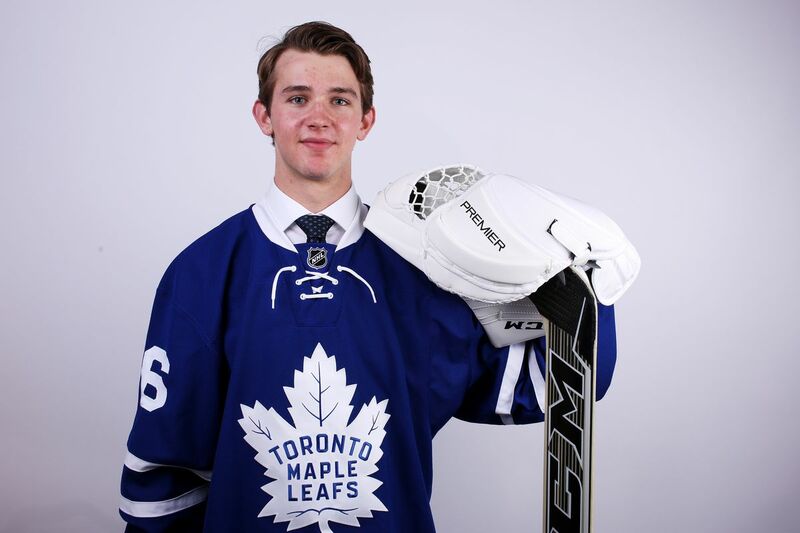 PERSONAL: Enrolled in the Carroll School of Management … is the 2016-17 recipient of The E. Paul Robsham, Jr. Goalie Scholarship Fund … was selected by the Toronto Maple Leafs in the third round (62nd overall) of the 2016 NHL Entry Draft … Joseph is the son of Bob and Shelley Woll. Exclusive interview with Clayton Keller, from the Arizona Coyotes, in Las Vegas before the NHL Awards. Humble kid, we really enjoyed having this guy on! Listen to him tell us about his path to the NHL. Having an exceptional rookie season with 65 points. Off ice training and much more. Keller hasn't let a lack of size (5-foot-10, 170 pounds), keep him from making a big impact in the NHL. The native of Chesterfield, Missouri, is among the new generation of small, nimble forwards such as Patrick Kane of the Chicago Blackhawks and Johnny Gaudreau of the Calgary Flames who have the skill to beat bigger opponents without taking a pounding. The Capitals win the Stanley Cup!!! Ovechkin finally etches his name on Lord Stanley's Cup and in NHL history. The week months long after party. The US Open and much more.. 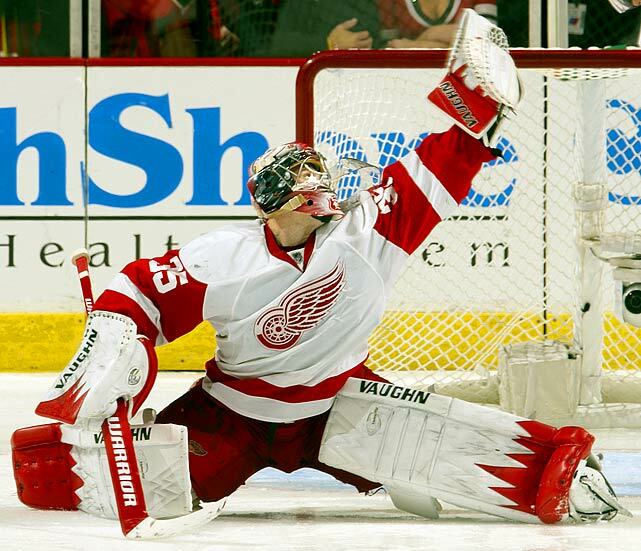 When Howard made his NHL debut with the Detroit Red Wings on Nov. 28, 2005, after three years at the University of Maine, they were in the process of compiling a staggering 124 points and winning the Presidents' Trophy with Chris Osgood and Manny Legace in net. And with Dominik Hasek taking over as the Red Wings starting the next season (he would help Detroit win the Stanley Cup in 2008), the goaltender from Ogdensburg, N.Y., found his path to the No. 1 goaltending job seemingly blocked again. He would spend the majority of four seasons with Grand Rapids of the American Hockey League. By the start of training camp in 2009, the Red Wings promoted Howard to back up Osgood, but Osgood struggled. By the middle of the season, Howard had assumed the starting position. And he didn't it let go. Howard finished with 37 wins, 3,740 minutes played, a 2.26 GAA and a .924 save percentage in 63 games and placed second in the voting for the Calder Trophy, awarded to the NHL's top rookie. Howard was selected by the Red Wings in the second round (No. 64) of the 2003 NHL Draft following three standout college seasons. He went 47-23-10 at Maine and helped lead it to the NCAA Frozen Four as a sophomore. BREAKING NEWS We got the story first here! After two seasons at Wisconsin, defenseman JD Greenway is leaving school and will play the 2018-19 season for the USHL’s Dubuque Fighting Saints. Dubuque acquired Greenway’s rights from the Chicago Steel on Thursday. Greenway, a 20-year-old originally drafted by the Steel during Phase II of the USHL draft earlier this month, played 46 games for the Badgers, scoring three goals and adding eight assists for 11 points. Greenway was selected in the third round (72nd overall) by the Toronto Maple Leafs in the 2016 NHL draft. 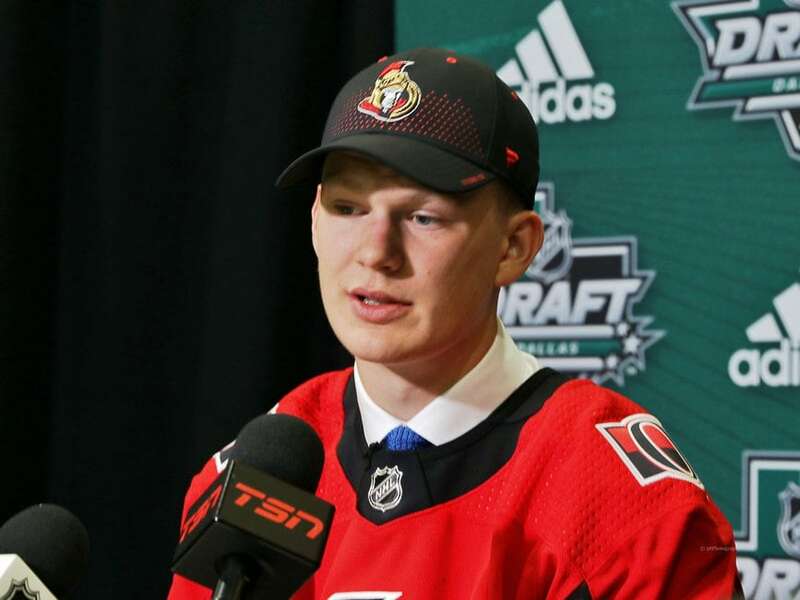 Boston University freshman forward Brady Tkachuk joins us to talk about his hockey path to B.U., the upcoming NHL combine, playoff hockey, and much more. Played in all 40 contests, tallying 31 points on eight goals and 23 assists ... Led team in assists (23) and shots (131) and finished fourth in points and second in plus-minus (+15) ... His 131 shots were the most of any freshman in the country ... Hockey East All-Rookie Team ... Hockey East Rookie of the Week on March 26 after picking up two assists in NCAA Northeast Regional ... Two-time Hockey East Top Performer ... Had a helper in 2-0 win over Providence in Hockey East championship on March 17 ... Scored a goal and recorded an assist in Hockey East quarterfinals series against UConn March 9-10 ... Provided an assist in 3-1 win at Merrimack on Feb. 17 ... Posted an assist in 3-3 tie versus UMass on Feb. 9 ... Scored twice in 8-0 shutout at Arizona State on Jan. 26 ... Found the back of the net in 3-1 win versus Merrimack on Jan. 20 ... Scored in back-to-back games against UMass Lowell Dec. 8-9 ... Lit the lamp and dished an assist in 7-4 win at Boston College on Dec. 1 ... Scored first collegiate goal in 7-0 shutout at Maine on Nov. 18 ... Registered a pair of assists against Minnesota State on Oct. 13 ... Helped Team USA capture a bronze medal at 2018 World Junior Championship. Spent two seasons with the U.S. National Team Development Program … Captured gold medal with Team USA at 2017 IIHF U18 World Championship, scoring seven points (1g, 6a) in the tournament and serving as a captain ... Finished fourth in scoring on the U.S. National Under-18 Team last season with 54 points (25g, 29a) after recording 25 points (9g, 16a) in 2015-16 with the U.S. National Under-17 Team ... Helped U.S. squad win the title at the 2016 and 2017 U17 Five Nations Tournaments ... Scored five points (2g, 3a) in six games at the 2015 World Under 17 Challenge ... Scored a team-best 43 points (15g, 28a) during the 2014-15 season for the Jr. Blues 16U team in the Tier 1 Elite league ... Projected to be a first-round pick in the 2018 NHL Draft. Born Sept. 16, 1999 ... Son of Chantal and Keith Tkachuk ... His father played one season at BU before embarking on an 18-year NHL career during which he played in 1,201 contests and five All-Star Games ... His older brother, Matthew, is a member of the Calgary Flames ... Enrolled in the College of General Studies. 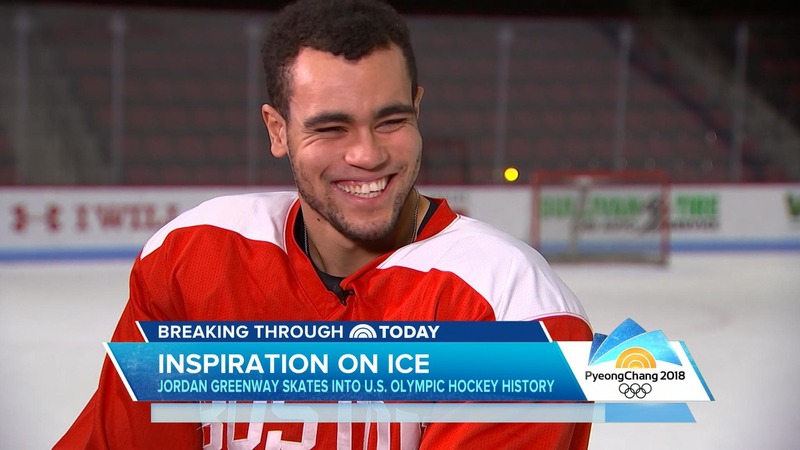 Jordan Greenway joins us to talk playoff hockey. Gavin Regan, a native of Potsdam, N.Y., has played a significant role at both the district and national levels of USA Hockey as a valuable member of the organization’s volunteer leadership for parts of the last three decades. In June 2013, he was elected a vice president of USA Hockey and chair of the organization’s international council. Regan, who has been a member of USA Hockey’s Board of Directors since 1995, was tabbed in 2004 to serve on the executive committee of USA Hockey as a director representative. He has been involved with USA Hockey’s New York state affiliate as a district director since 1991; has been on the player development committee for the state for more than 20 years; and has served as team leader for several boys’ New York Select Teams at USA Hockey National Festivals. Since 1999 Regan has been involved with USA Hockey’s Women’s National Team Program. He served as the team leader for the 2005 U.S. Women’s National Team in the lead up to the 2006 Olympic Winter Games, including a 22-game pre-Olympic training schedule. In 2001 and 2002, he was an assistant to the team leader and also traveled with the 2001-02 U.S. Women’s National Team during legs of the Visa Skate To Salt Lake Tour. Regan has served as camp director for the USA Hockey National Women’s Festival in Lake Placid, N.Y., since 2002 and has been the team leader for the U.S. Women’s National Team at multiple Four Nations Cup tournaments. Regan served as team leader for the gold medal-winning U.S. team at the 2005 International Ice Hockey Federation Women’s World Championship in Sweden. He held the same post during the 2004 event in Nova Scotia, Canada. Regan first worked with the 2003 U.S. Women’s National Team scheduled to compete in the IIHF Women’s World Championship in Beijing, China. That tournament, however, was cancelled due to SARS virus concerns. Regan, who for the past 25 years has forged a successful career in banking and finance, resides in Potsdam, N.Y., with his wife, Jeri, daughters Harley and Kiona and son, Carson. 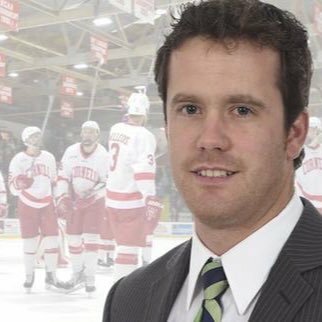 Sean Flanagan has completed one season as an assistant coach for the men’s hockey team, helping the guide the Big Red to a 21-9-5 record in 2016-17 and return to the NCAA championships for the first time in five years. Flanagan joined the Big Red after a couple stops following a four-year playing career at St. Lawrence. His most recent experience was at UMass-Lowell, where he served as the River Hawks’ director of hockey operations for the 2015-16 season. Prior to that, Flanagan was the assistant coach at Hobart from 2012-15. Working under former Cornell assistant coach Mark Taylor with the Statesmen, Flanagan helped build a team that won the ECAC West title in 2015 and 2016 to reach the NCAA tournament. Hobart was the No. 1 seed in the NCAA’s East Region last year. No stranger to ECAC Hockey, Flanagan played 121 career games with St. Lawrence up to the 2010-11 season. He racked up 12 goals and 40 assists for 52 points, helping the Saints advance to the league’s championship weekend twice over his four years. He served as an assistant captain during his senior season, then went on to play professionally with the Las Vegas Wranglers and Quad City Mallards in the ECHL. Flanagan graduated from St. Lawrence with a bachelor of arts degree in history with a minor in sports studies and exercise sciences in 2010. He also earned a master of education degree from St. Lawrence in 2011. We got the story first here! SAINT PAUL -- Minnesota Wild General Manager Chuck Fletcher today announced the NHL club has signed forward Jordan Greenway to a three-year, entry-level contract starting with the remainder of the 2017-18 season. The team also announced it has reassigned forward Zack Mitchell to the Iowa Wild of the American Hockey League (AHL). Greenway, 21 (2/16/97), recorded 35 points (13-22=35) and 52 penalty minutes (PIM) in 36 games during his junior season at Boston University, helping the Terriers claim the 2018 Hockey East Tournament Championship and advance to the NCAA Northeast Regional Final. The 6-foot-6, 226-pound native of Canton, N.Y., served as an alternate captain in 2017-18, ranking T-1st on the Terriers in points, second in assists and PIM, T-2nd in PPG (4), third in goals and shots on goal (127), and was named a Hockey East Third-Team All-Star. He also collected a goal, 10 PIM and 13 shots in five games with Team USA at the 2018 Winter Olympics in PyeongChang, South Korea, leading the U.S. in PIM and ranking third in shots. In three seasons with Boston University (2015-18), Greenway totaled 92 points (28-64=92) and 192 PIM in 112 games. Greenway skated in eight games with Team USA at the 2017 IIHF World Championship. He notched eight points (3-5=8) in seven games to help the United States win the gold medal at the 2017 IIHF World Junior Championship, ranking T-2nd on Team USA and T-8th in the tournament in scoring. He also helped the United States earn the gold medal at the 2015 IIHF Under-18 World Championship, registering seven points (1-6=7) in seven games. He collected 46 points (15-31=46) in 55 games during two seasons with United States National Team Development Program (2013-15) and won championships at the 2014 Under-18 Four Nations Tournament, the 2014 Under-17 Five Nations Tournament, the 2014 World Under-17 Hockey Challenge and participated in 2014 CCM/USA Hockey All-American Prospects Game. 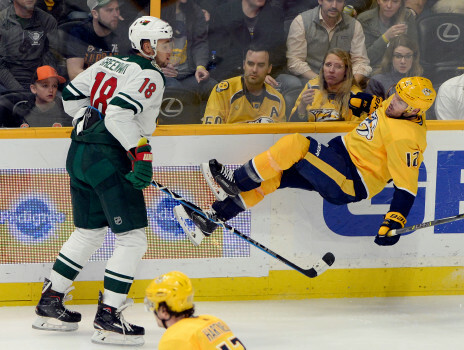 Greenway recorded 62 points (23-39=62) in 46 games with Shattuck St. Mary's in Faribault, Minn., in 2012-13. - Ryan Danato, Harvard, USA Men's MVP, Hobbie Baker, 1st two NHL games he tallied 2g, 2a for the Bruins. - The NHL Playoff rush.